Dragon Well Green Tea Shrimp with sweet and sustainable (unfortunately precooked) Oregon pink shrimp. Somehow blogging has gotten away from me again, with the start of the new term. Evenings are chilly here now — fall is in the air. Pumpkins and other orange-fleshed winter squashes fill the markets, while we’re still enjoying the last of this fickle summer’s (mostly green) tomatoes, cukes and zukes. I’m trying to enjoy it all (and put some food up as time allows) before it slips from our grasp. I’ve been reporting from the Coast some for KLCC. In Newport recently, I had a chance to pick up some extra-fresh (and sustainable!) tiny Oregon pink shrimp at Local Ocean. I thought they might most resemble the sweet, Chinese river shrimp you can’t find here. I needed them for the Longjing xiaren (Dragon Well green tea shrimp) recipe I ran with my recent NPR Kitchen Window column. Only problem is the Oregon shrimp only come pre-cooked. So I just cooked them as quickly as possible with my recipe. They fell apart a bit, but still had a sweet, mild taste. I especially recommend dipping the sauteed shrimp in sherry (or similar brown) vinegar for an umami punch. That’s how the Longjing Xiaren were served at the tony 28 Hubin Road restaurant at the Grand Hyatt in Hangzhou. 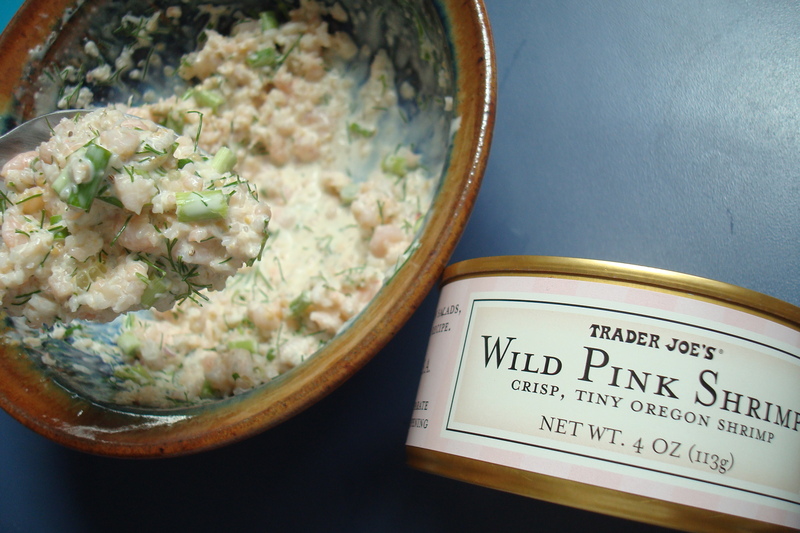 Just whatever you do, don’t use canned Oregon pink shrimp from Trader Joe’s. I was excited to find them, but they’re disappointingly mushy and fishy. 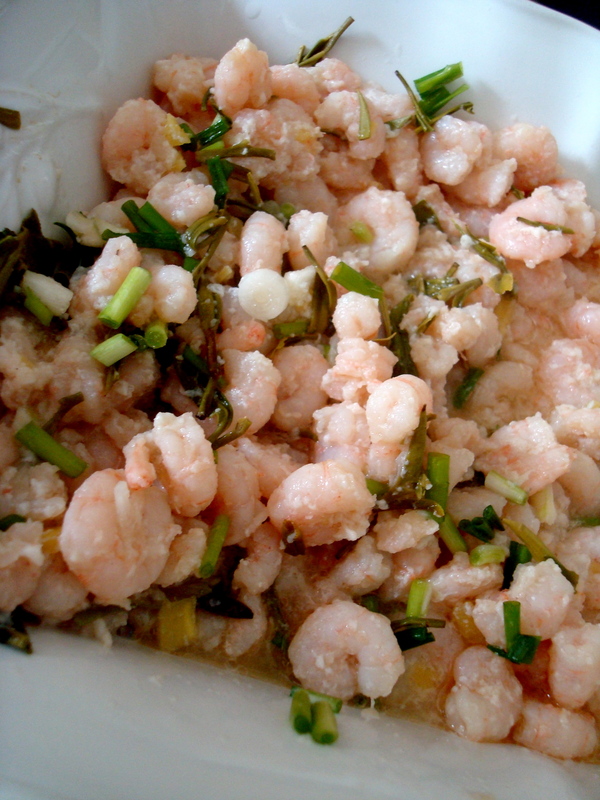 I tried in vein to make a shrimp salad with them. There are other salads I’d like to try with the fresh specimens, such as this Asian shrimp salad from Portland-based Newman’s Fish Company. Sorry, Trader Joe's: Your canned Oregon shrimp are mushy and fishy, really anything but crisp. These are so delicious! I just got a great Chinese cookbook in the mail today with most of my favorites. It was very hard to find as it’s out of print but it’s a nice copy so life is good. Thanks for posting this shrimp recipe! I made it last week and it was lovely. Happy Autumn! Hope it brings you lots of spiced cider and fallen leaves. Thanks for your kind words, Erin? Did you try dipping the shrimp in sherry vinegar before eating? I thought that really made an otherwise bland dish much more flavorful. But it’s all about the subtle flavor, right? Adding garlic and ginger here would drown out the essence of green tea.